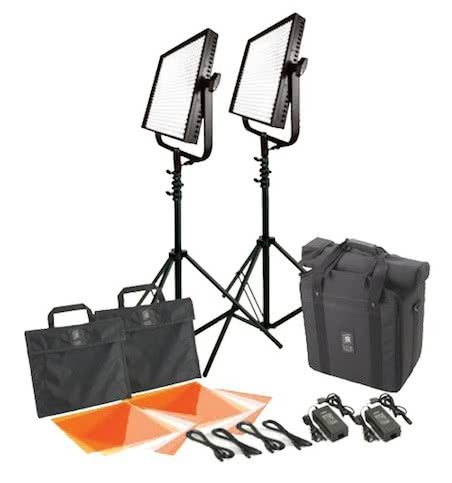 The Litepanels 1x1 Daylight LED Kit is a complete continuous lighting kit suitable for both still and video production. LED lighting is cool to the touch and lightweight. The flood light sports a 50º beam while the spot has a 30º beam. They are fully tiltable and accommodate 18-28V DC battery packs when you optionally rent an Anton Bauer Battery Plate and Anton Bauer Battery. Otherwise, you just plug these lights into AC power with the included power cords. A set of tungsten and diffusion gels are also included and slip easily onto the front of the light heads and can be stacked. Without the gels, you will not be able to adjust the temperature of these lights. For a similar set with native temperature dialing, see the Litepanels 1x1 Flypack Bi Color and Bi Focus LED Kit. The Litepanels 1x1 Daylight LED Kit can be dimmed, is flickr-free, suppresses color shifting, and only draws about 40W in power. These lights work well for documentary lighting, lower-key product lighting, and replicating window light. • These continuous lights do not natively change color temperature and are daylight balanced. Gels must be used to change the temperature. • These lights can be dimmed. • These lights require AC power to operate unless you optionally rent an Anton Bauer Battery Plate and Anton Bauer Battery. You would need 1 plate and 1 battery for every light head you're trying to power.